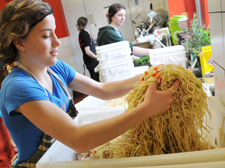 St. John’s Kitchen is a unique community resource. It is much more than a dining room – it is a place of conversation, friendship, and shared creative work. It is a meaningful community – rich, complex, and continuously evolving. Everyone is welcome around the table at St. John’s Kitchen. For over 30 years, donations from community members have made the work of St. John’s Kitchen possible. Community donations still make up the bulk of our operating budget. Since 2012, there has been a shift in the challenges affecting the population who gather at St. John’s Kitchen. A significant increase in the use of various street drugs, in particular crystal meth, has led to higher and more complex needs. With this shift, workers at St. John's Kitchen need to spend more time with each person in order to build and maintain relationships. At the same time, there are increasingly more new faces coming to the space. These changes mean that currently, The Working Centre and St. John’s Kitchen are stretching resources in order to meet people’s needs. Your contributions give life to St. John’s Kitchen. With the continuing support of our local community, St. John’s Kitchen will continue to thrive as a place of gathering and support for people, for many years to come.